Chad Wilson (center), vice president/commercial banking manager at First State Bank, recently graduated from the Graduate School of Banking at the University of Wisconsin-Madison. He is pictured with his wife, Amie, and son, Krew. The team at First State Bank has announced that Chad Wilson was awarded a diploma on Aug. 10 at commencement exercises during the 74th annual session of the Graduate School of Banking at the University of Wisconsin-Madison. Wilson is the vice president/commercial banking manager at First State Bank. The Graduate School of Banking enrolls approximately 600 U.S. and international professionals each year. More than 85 academicians, economists, government officials, and industry professionals comprise the school’s faculty. Richard Baier, chairman of the Graduate School of Banking and Prochnow Educational Foundation Board of Trustees, as well as the president of the Nebraska Bankers Association, was the featured speaker at commencement. For more information about the Graduate School of Banking, please visit www.gsb.org. Submitted by Lauren K. Hamilton, marketing coordinator, First State Bank. 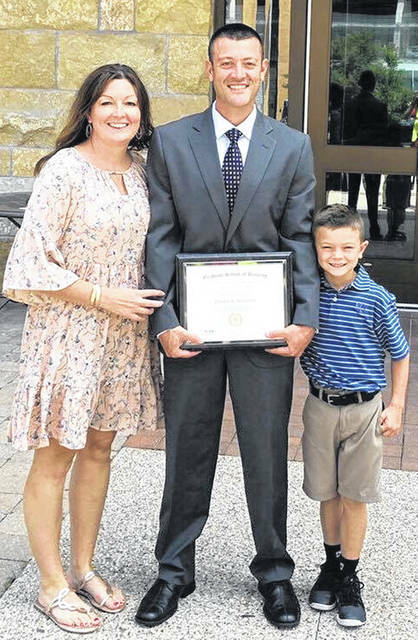 https://www.timesgazette.com/wp-content/uploads/sites/33/2018/08/web1_Wilson-pic-1.jpgChad Wilson (center), vice president/commercial banking manager at First State Bank, recently graduated from the Graduate School of Banking at the University of Wisconsin-Madison. He is pictured with his wife, Amie, and son, Krew.